Eight students at the University of Mississippi‘s Croft Institute for International Studies are recipients of this year’s distinguished Croft Scholarships. The prestigious scholarships pay up to $32,000 over four years, and the funds can be combined with other scholarships. Croft Scholars retain the funds as long as they stay in the international studies major and maintain a 3.4 grade-point average both in the major and overall. 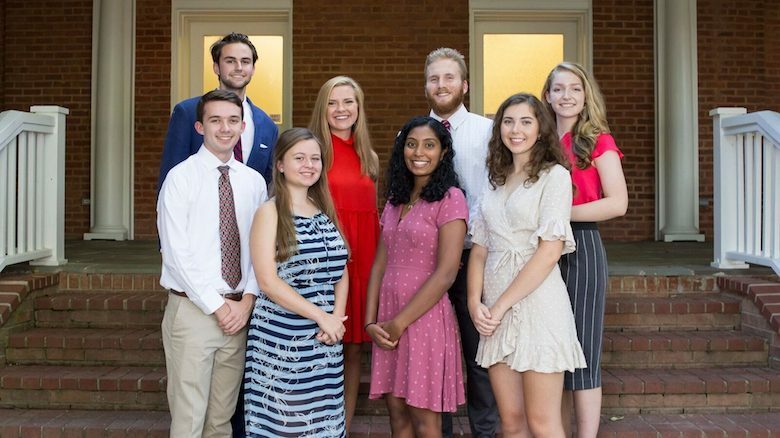 The eight students are Jess Cooley, Ava Cooper, Olivia Jaramillo, Emma Lane, David McDonald, Reed Peets, Delaney Smith and Akshaya Vijayasankar. For their international studies major, Croft students typically select a regional concentration from among East Asia, Europe, Latin America and the Middle East, and a related foreign language before their first semester in the program. Students later select a thematic concentration from among global economics and business, global health, international governance and politics, and social and cultural identity. “We are very excited about this group of Croft Scholars,” said Oliver Dinius, Croft executive director. “Their chosen foreign languages represent all of Croft’s four regions and they have already expressed broad thematic interests, although they will not have to declare that concentration until their sophomore year. Of more than 217 applicants to the Croft Institute this year, 128 were admitted, and from that pool, the admissions committee selected 29 prospective students to interview for the scholarships. They answered follow-up questions about their application essays and questions about current affairs, their intellectual interests and their motivations for pursuing a bachelor’s degree in international studies. A native of Laurel and graduate of West Jones High School, Cooley is studying Spanish with a concentration on Latin America. Cooper, a native of Knoxville, Tennessee, graduated from Berean Christian High School and is studying Chinese with a concentration on East Asia. Jaramillo is a native of Murfreesboro, Tennessee, and a graduate of Central Magnet School who is studying Spanish with a concentration on Latin America. Lane is from La Grange, Kentucky, and a graduate of Oldham County High School who is studying Arabic with a concentration on the Middle East. “For me, my college experience depended on this Croft Scholarship,” Lane said. “It has allowed me to live in Pittman (Hall) among my other Honors College peers, and it allowed me to attend Ole Miss without taking out any loans. From Madison, McDonald graduated from Madison Central High School and is studying Russian with a concentration on Europe. A graduate of Jackson Preparatory School and native of Jackson, Peets is studying Spanish with a concentration on Latin America. “It is an awesome honor to be recognized by such an outstanding institution,” Peets said. “To have my name among the top scholars of the Croft Institute is a humbling responsibility. Smith is from Overland Park, Kansas, and graduated from Saint Thomas Aquinas High School. She is studying German with a concentration on Europe. “I’m so honored to be a student of the Croft Institute and to have been chosen as a recipient of the Croft Scholarship,” Smith said. “The Croft Institute allows me to study a subject that I’m passionate about alongside incredibly gifted classmates. An Oxford native, Akshaya Vijayasankar is a graduate of Oxford High School studying Spanish with a concentration on Latin America. “I am extremely grateful and humbled to be a recipient of this award,” Vijayasankarsaid. “The Croft Institute of International Studies has allowed me to pursue my passion for studying global health care and Spanish, and receiving this scholarship has put me one step closer to achieving my dream.